the W18 NX001 bass driver. With a height of 50 cm the Bifrost is an exceptionally high bass reflex speaker. The name "Bifrost" originates from the Nordic mythology (a bridge linking the empire of the Gods with that of men). The cabinet can be built either from wood or stone. 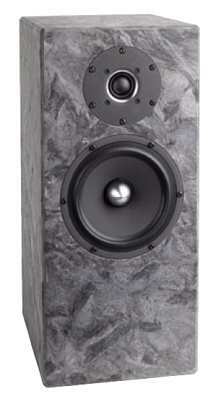 Those of you who wish to have a cabinet made of stone can purchase this from Valeria Audio (phone: +49 - 2272 - 90 49 00). The crossover consists of a 3rd order filter for the bass driver. The bass driver shows a slight exaggeration at 4 kHz. This exaggeration is eliminated by a steep crossover cut-off. A different solution would be to use a bandpass filter to suppress the resonance. The tweeter is cut-off with 2nd order filter. Please note: This kit is equipped - according to Klang+Ton - with Intertechnik PK14/58MS/NI binding posts which we supply as well. The surcharge is 12 EUR per speaker. The following kit with high-end crossover also contains the PK14/58MS/NI binding posts. Upon request the Bifrost is available with the following, high-end components. Since core coils produce non-linear distortion, generating additional harmonics not contained in the original music, we supply our high-end crossover with coreless coils, i.e. air core coils. As coils for the signal path we chose cfc coils, for the tweeter we took a backed varnish coil. The capacitors in the signal path are lowest-loss Mundorf MCAP Supreme, otherwise Mundorf MKP capacitors with 400V.